As I have mentioned several times here on my blog, I love food which is both delicious and at the same time very easy to prepare. It is great to work in the kitchen for several hours and create fantastic gourmet meals. However, the fact is that most of the time you spend in the kitchen is to prepare everyday breakfast, lunch and dinner. That is way I am always on the lookout for recipes for great and fast food. 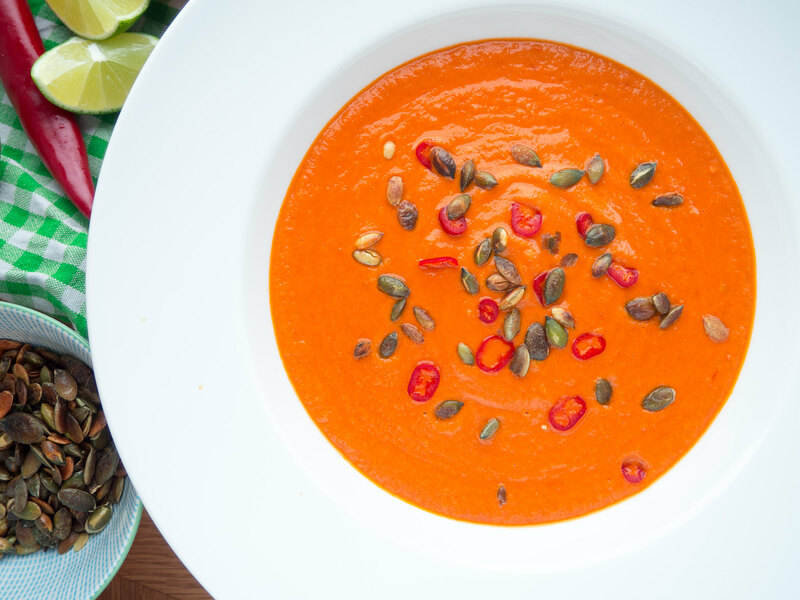 This spicy tomato lime coconut soup is one of these great recipes if you ask me. 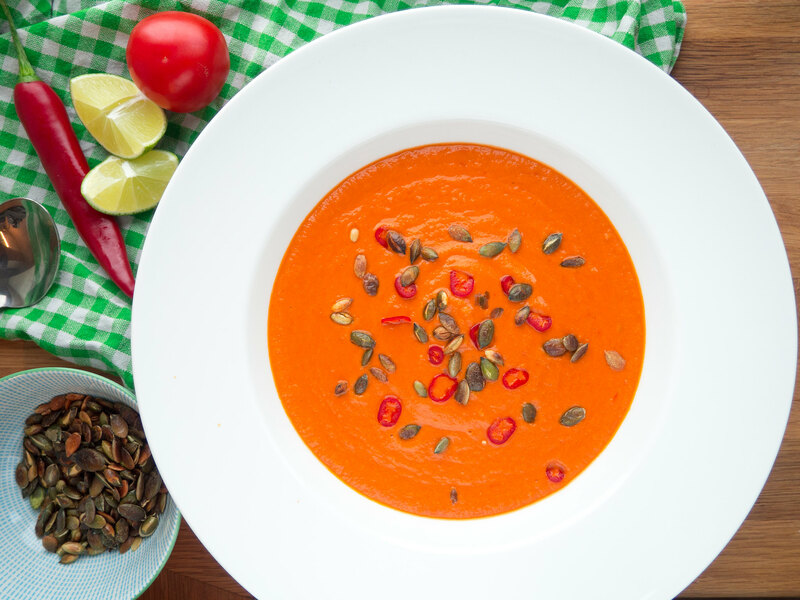 This spicy tomato soup is super easy to prepare and it has a wonderful taste. 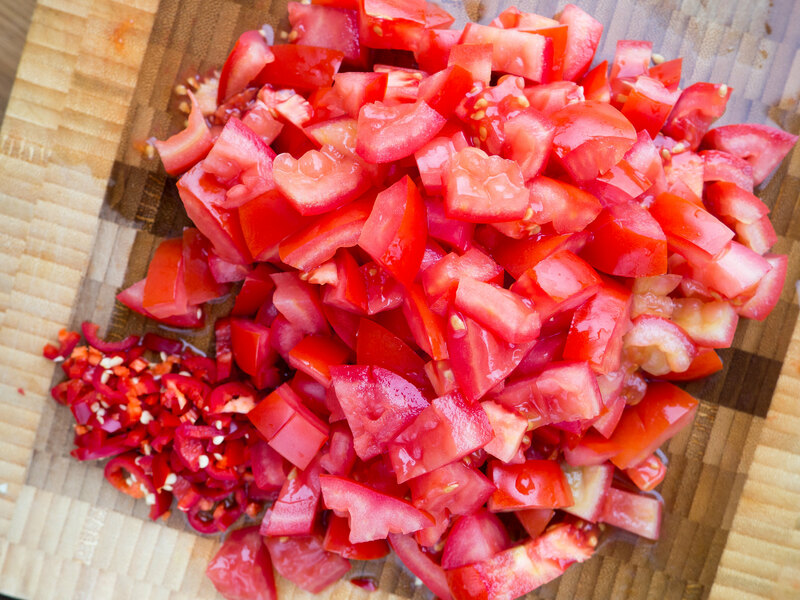 I personally think that the combination between the spicy chili goes perfectly together with the fresh tomatoes and lime. A finally the coconut milk gives the soup a wonderful creamy consistency. Besides being very tasteful, this dish is also super easy to make. From start to finish, it takes about 20-25 minutes to make this soup. Of course, the first couple of times it might take a little extra time but once you got feeling it is a very time-optimized dish, which is perfect as a midweek dish or maybe as a starter for a weekend meal. 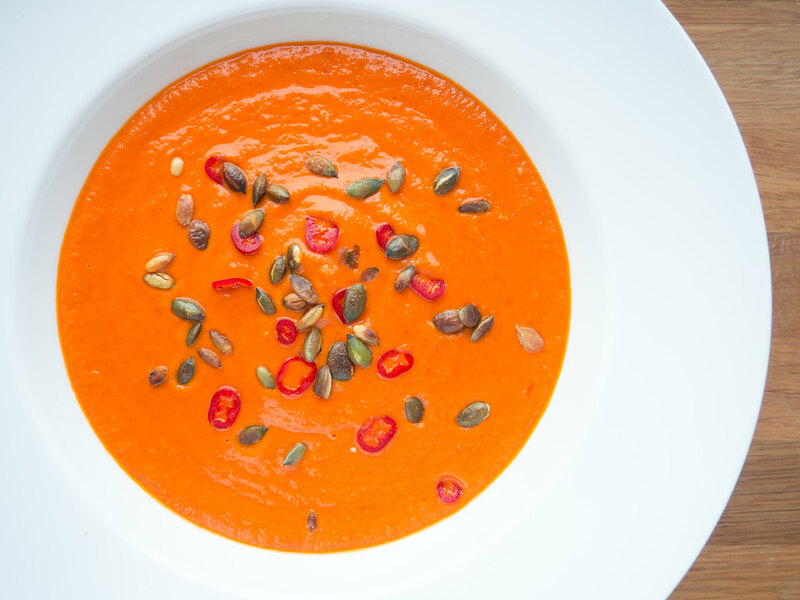 Serve it with a couple of fresh lime wedges, some roasted pumpkin seeds and some finely chopped red chili. Overall this soup is just fantastic if you ask me. 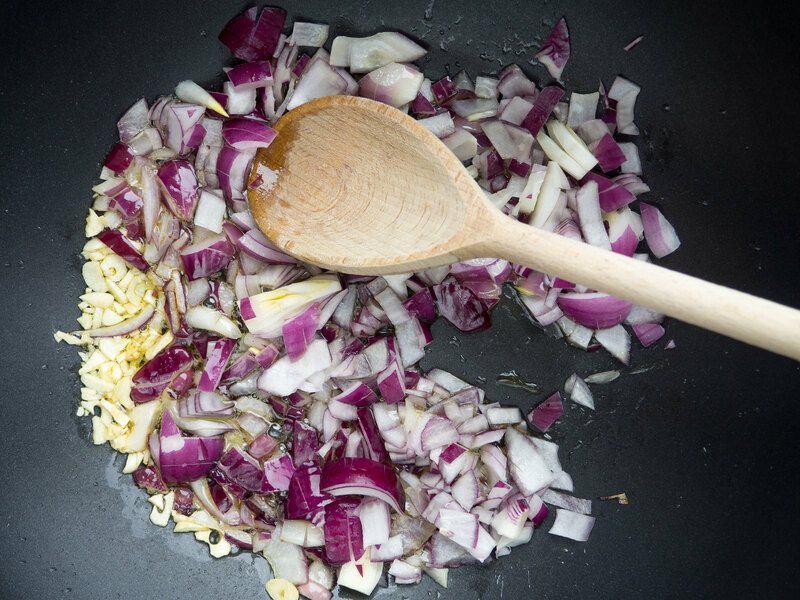 In some hot olive oil, you start by frying the coarsely chopped onion and garlic for a couple of minutes. 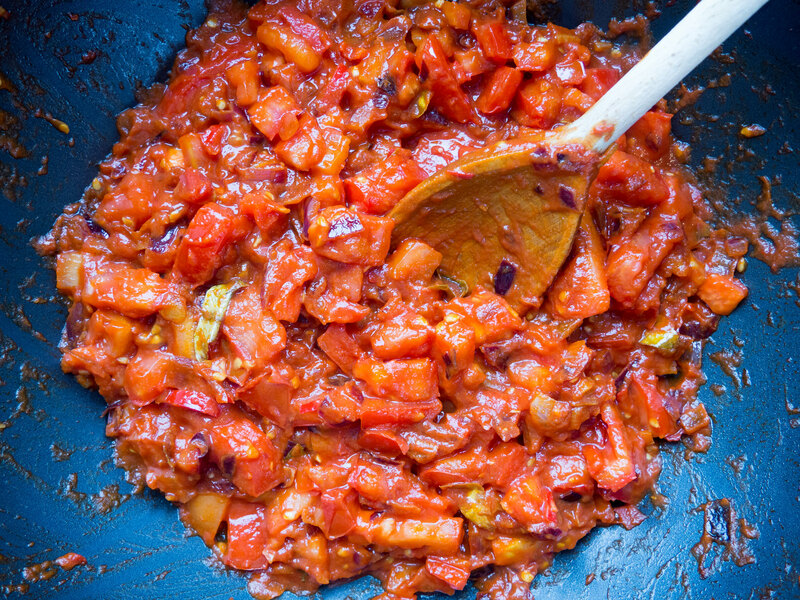 Then add the tomato paste, grated ginger (or ginger juice), chopped red chili, kaffir leaves – fry for about 5 minutes before adding the coarsely chopped tomatoes. Then add the coconut milk and let the soup simmer for 10 minutes before blending the soup nice and smooth using a hand blender. If you think the soup is a little too thick then add a little milk or water. Finally add salt and lime juice to taste. I normally prefer the juice from one lime. 1. 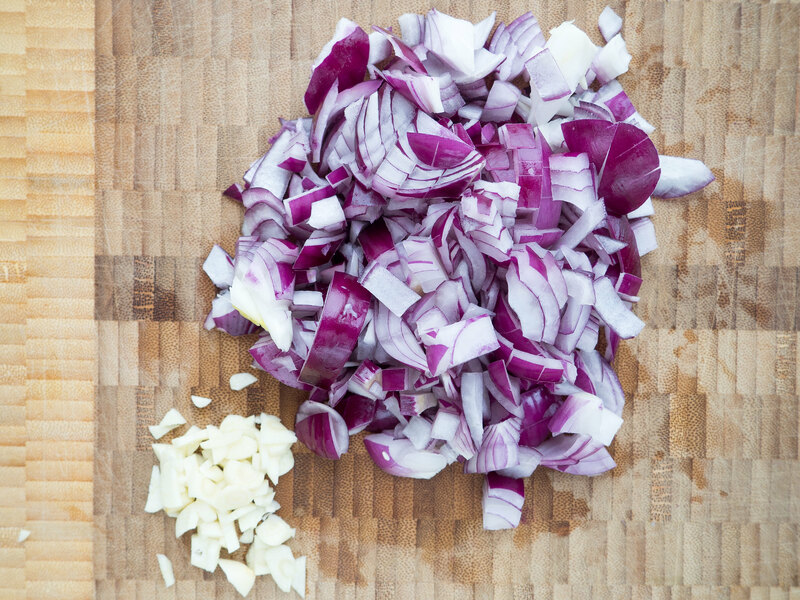 Coarsely chop the garlic and onions. 2. 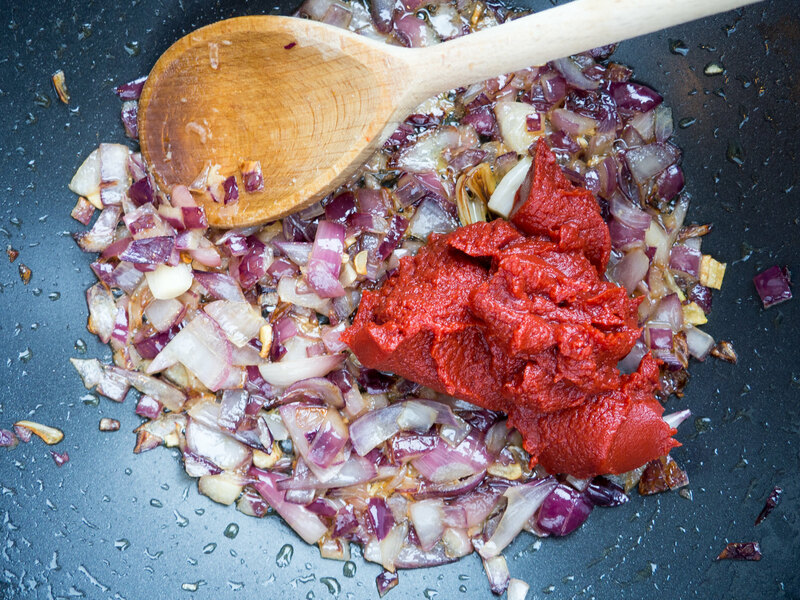 In a large saucepan or wok pan: heat up the olive oil and fry the garlic and onions for about 3-5 minutes. 3. 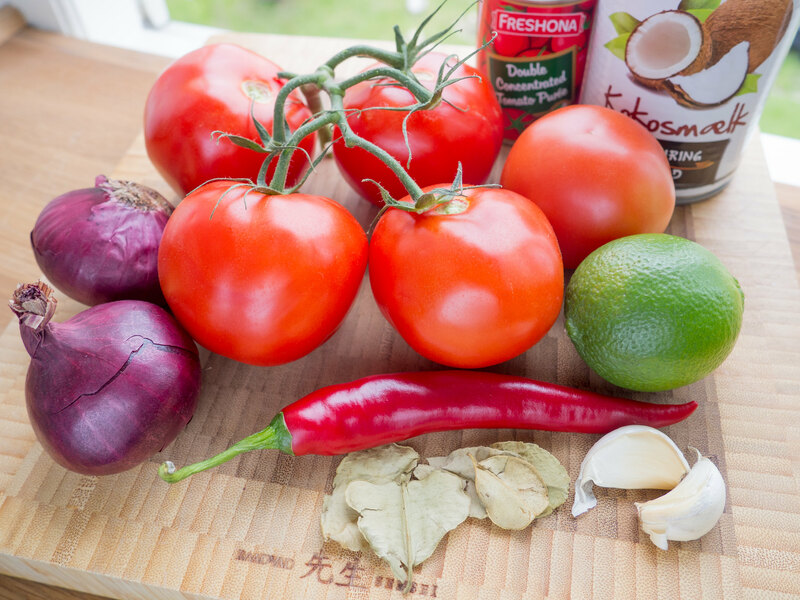 Add the tomato paste, chopped red chili, grated ginger (or juice) and kaffir leaves without the stem. 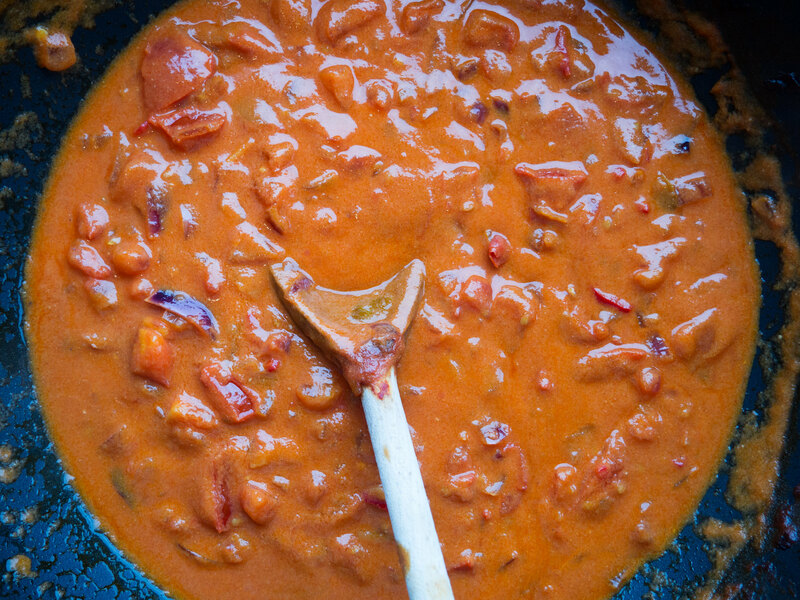 At medium heat, fry/simmer everything for about 5 minutes. 4. 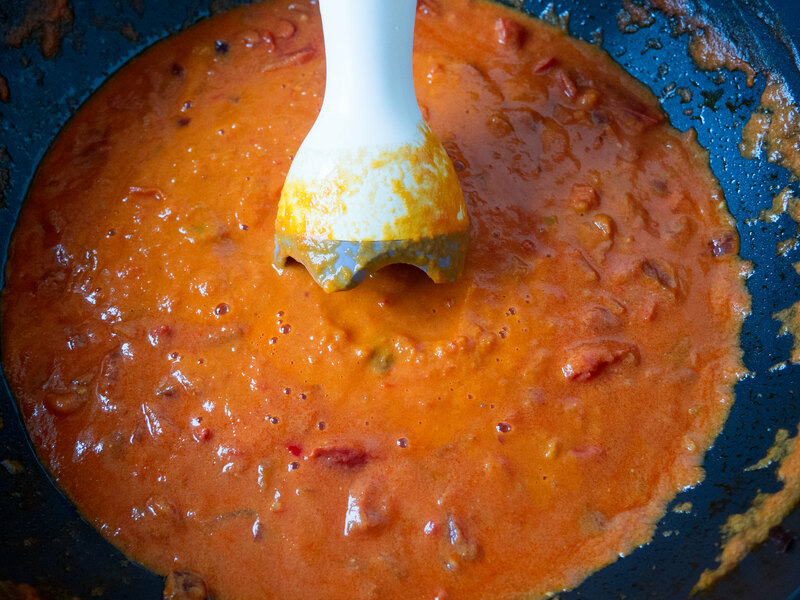 Then add the coarsely chopped tomatoes and let it simmer for another 5 minutes. 4. Add the coconut milk and let the soup simmer for about 10 minutes. 5. Remove he larger Kaffir leaves and then use a hand blender (or pour the soup in a regular blender) to blend everything into a thick and smooth soup. Now make an evaluation of the consistency. If you find it too thick then add a little milk or water. 6. Add the lime juice and salt according to taste. Normally the juice from one lime is sufficient. 7. On a dry frying pan, fry some pumpkin seeds for a couple of minutes. Use them as topping for the soup. 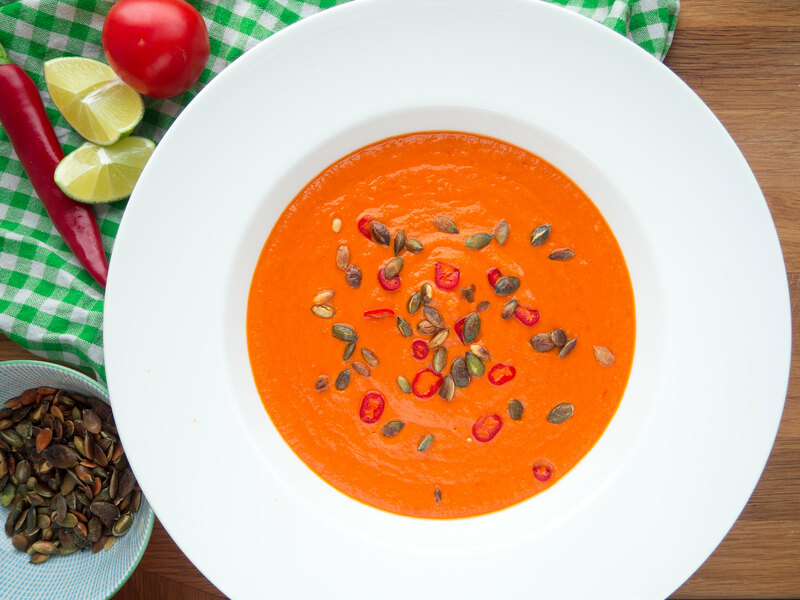 Tip: Serve the soup hot with the fried pumpkin seeds and some extra lime wedges.